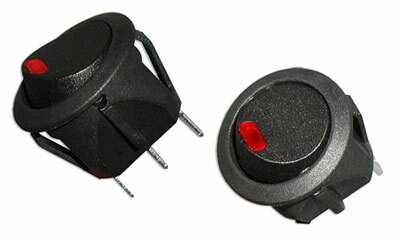 The RR2 Series illuminated round rocker switch is miniature in size. With multiple latching options, the RR2 Series SPST rocker switch offers quick connect/solder lug termination with Off-On switch function. LED color options, include bi-color choices, and lens color options, the RR2 Series is available with multiple housing and actuator color choices. Have a look at our SPST/SPDT rocker switch if you prefer not to use an illuminated option.